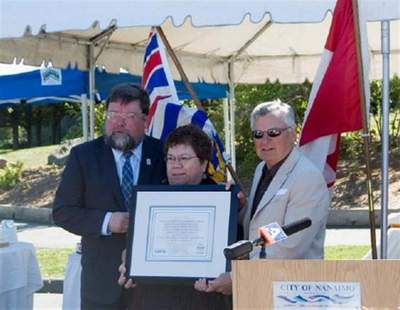 The Snuneymuxw First Nation, City of Nanaimo and Nanaimo Port Authority today celebrated a historic land transfer agreement in a traditional Hul’qumi’num witnessing ceremony. Gathering with invited guests on the old Foundry site adjacent to Maffeo Sutton and Swy-a-Lana Lagoon Parks, Snuneymuxw Chief Viola Wyse, Nanaimo Mayor Gary Korpan, and Port Authority Chair Ross Fraser described the events leading up to the transfer of lands on the former Foundry Site to the ownership of the Snuneymuxw First Nation. Port Board Chair Ross Fraser commented, "This specific action represents an important milestone for Snuneymuxw, and the Port is pleased and proud to have played a key role in helping Snuneymuxw to move forward to a new level of participation in our community. Taken together, Lot 100 and Lot 50 give Snuneymuxw a site in the heart of downtown, next to popular Swy-a-Lana Lagoon Park." Fraser noted that Swy-a Lana had been developed by the Port as a gift to the community many years ago. Today’s celebration included the presentation of a ceremonial transfer document by Mayor Gary Korpan and Port Chair Ross Fraser to Chief Viola Wyse.